COLORADO SPRINGS, Colo. -- Dealing with the decades of detritus from using outer space -- human-made orbital debris -- is a global concern, but some experts are now questioning the feasibility of the wide range of "solutions" sketched out to grapple with high-speed space litter. What may be shaping up is an "abandon in place" posture for certain orbital altitudes -- an outlook that flags the messy message resulting from countless bits of orbital refuse. U.S. General William Shelton, commander of Air Force Space Command, underscored the worrisome issue of orbital debris during a presentation at the National Space Symposium on April 12, 2011. In a recent conference here, Gen. William Shelton, commander of the U.S. Air Force Space Command, relayed his worries about rising amounts of human-made space junk. "We catalog those routinely and keep track of them. That number is projected to triple by 2030, and much of that is improved sensors, but some of that is increased traffic," Shelton said. "Then if you think about it, there are probably 10 times more objects in space than we're able to track with our sensor capability today. Those objects are untrackable … yet they are lethal to our space systems -- to military space systems, civil space systems, commercial -- no one’s immune from the threats that are on orbit today, just due to the traffic in space." "It may be a pretty tough neighborhood," Shelton continued, in low-Earth orbit and geosynchronous Earth orbit "in the not too distant future." When asked if the U.S. Air Force plans on funding space debris mitigation capability, Shelton responded: "We haven’t found a way yet that is affordable and gives us any hope for mitigating space debris. The best we can do, we believe, is to minimize debris as we go forward with our operations. As we think about how we launch things, as we deploy satellites, minimizing debris is absolutely essential and we’re trying to convince other nations of that imperative as well." Shelton said that, unfortunately, with the duration of most things on orbit, "you get to live with the debris problem for many, many years and in some cases decades. So minimizing debris is important to us and it should be to other nations as well." The concern over orbital debris has been building for several reasons, said Marshall Kaplan, an orbital debris expert within the Space Department at the Johns Hopkins University Applied Physics Laboratory in Laurel, Md. In Kaplan's view, spacefaring nations have passed the point of "no return," with the accumulation of debris objects in low-Earth orbits steadily building over the past 50 years. Add to the clutter, the leftovers of China’s anti-satellite (ASAT) test in 2007. "The fact that this single event increased the number of debris objects by roughly 25 percent was not as important as the location of the intercept. The event took place at an altitude of 865 kilometers, right in the middle of the most congested region of low-orbiting satellites," Kaplan pointed out. Toss into the brew the collision of an Iridium satellite with an expired Russian Cosmos spacecraft in February 2009 -- at an altitude similar to that of China’s ASAT test. 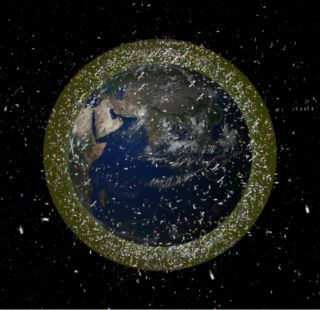 As a result of 50 years of launching satellites and these two events, the altitude band from about 435 miles (700 km) to a little over 800 miles (1,300 km) has accumulated possibly millions of debris objects ranging from a few millimeters to a few meters, Kaplan said. On Feb. 10, 2009, a defunct Russian satellite, right, and a privately owned American communications satellite, left, collided near the North Pole, producing clouds of debris that quickly joined the orbital parade of clutter, increasing the possibility of future accidents. "The buildup of debris is not a naturally reversible process. If we are to clean up space, it will certainly be complex and very expensive. If we continue, as we have, to use these very popular orbits in near-Earth space, the density of debris and collision events will surely increase," Kaplan told SPACE.com. The good news is that no immediate action is necessary in terms of removing debris objects, Kaplan advised, as experts estimate that the situation will not go unstable anytime soon. "But, when it does, operational satellites will be destroyed at an alarming rate, and they cannot be replaced. We must prepare for this seemingly inevitable event," Kaplan said. While there are many options for debris removal that have been proposed, he feels that none are sensible. For Kaplan, the issue of dealing with orbital debris will become dire. "The proliferation is irreversible. Any cleanup would be too expensive. Given this insight, it is unlikely spacefaring nations are going to do anything significant about cleaning up space," Kaplan said. "The fact is that we really can't do anything. We can't afford it. We don't have the technology. We don't have the cooperation. Nobody wants to pay for it. Space debris cleanup is a 'growth industry,' but there are no customers. In addition, it is politically untenable." Known orbit planes of Fengyun-1C debris one month after its 2007 disintegration by a Chinese anti-satellite (ASAT) interceptor. The white orbit represents the International Space Station. All that being said, can anything be done? Kaplan says he can imagine the future … and things don't look pretty. "There is a good chance that we may have to eventually abandon all active satellites in currently used orbits," Kaplan said. "One possible scenario for the future is that we may phase out this generation of spacecraft while replacing them with a brand-new infrastructure of low-orbiting constellations of small satellites, each of which partially contributes to collecting desired data or making communications links." These constellations could be placed below 370 miles (600 km), thus avoiding the debris issue. "Such a new infrastructure could be developed over the next 20, 30 or 40 years," Kaplan said. "We should have plenty of time to make the transition, so let's use it wisely. We all caused this problem … there is no doubt about that. And, nobody will claim somebody else did it." Meanwhile, outer space is still "big" … but it’s getting smaller. "The question is: when is it going to get too small? That’s the real question, and we don't know," Kaplan said. "Nobody is really going to yell uncle until we have some more serious collisions. That could happen anytime or it could happen in 20 years, we just don't know." Leonard David has been reporting on the space industry for more than five decades. He is a winner of this year’s National Space Club Press Award and a past editor-in-chief of the National Space Society's Ad Astra and Space World magazines. He has written for SPACE.com since 1999.